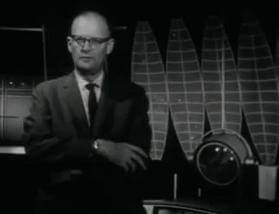 SciFi legend Arthur C. Clarke gives us a vision of the distant future - the year 2000! Arthur C. Clarke predicted the rise of telecommuting, telemedicine, and mobile phones decades before they existed. I recently came across his televised interview with the BBC Horizon program recorded in 1964. In it, the world famous writer, inventor, and science promoter shares his vision for the world of tomorrow. A world in which you and I currently live. As Singularity Hub strives to provide some insight into how emerging technologies may develop and affect our world in the years ahead, I thought it would be enlightening (and humbling) to see how one of the last century’s most creative and brilliant minds handled predicting our future. The 1964 BBC interview is provided for you, in full, in the two videos below, along with Clarke’s last interview given in 2007 at age 90. It’s remarkable what Clarke got right in his predictions, hilarious what he got wrong, and thought-provoking in what yet remains to be seen. Considered one of the ‘big three’ science fiction writers of the 20th century, Clarke also helped originate the idea of using geostationary orbits for communication satellites. As such, it may not be surprising that while many of his predictions seem outlandish his thoughts on telecommunication were remarkably prescient. By the year 2000 a good deal of the world could talk to their friends (via mobile phones) without knowing their exact locations. We’ve also seen how business travel may be slowly being replaced with telepresence, and telemedicine is a rapidly developing technology. All of these predictions can be heard in the first half of the Horizon program seen in the video below. The Arthur Clarke interview begins at 3:50. Of course, we have to take Clarke’s failures with his successes. Mentally enhanced chimps as a new servant class? The end of cities (due to telecommunication)? These haven’t happened yet, and I personally don’t see them coming true any time soon. But if you were to categorize Clarke’s predictions, the biggest group would certainly be “still undetermined”. Clarke’s hopes for space exploration (including moon bases, terra-forming, and the location of alien civilizations) are not inconceivable, though some would argue them unlikely. We also can’t be sure how artificial intelligence will develop in the years ahead. Although narrow AI has already made leaps and bounds since Clarke’s days, he expressly predicted greater than human-like intelligence and the supplanting of the human species. It’s yet to be seen if mechanical evolution, as Clarke puts it, will supersede biological. Recording onto brains is still a possibility. We’ve actually seen some progress with suspended animation, though not to the degree Clarke wished for. Replicators…well those were a long term prediction. Overall, most of his vision is still too far out for us to have proven or disproven. Which is the result you’d expect when you don’t put many dates on your predictions. At the end of 2007, when Clarke was nearing 90, TVE Asia Pacific recorded what is traditionally considered the author’s last interview. While he doesn’t go into great depth about his visions for the future, he does mention (starting around 2:30) his excitement for commercial spaceflight and the adoption of the mobile phone. As you can see, towards the end of his life Clarke seemed to care more about humanity’s grand challenges (especially peace and the environment) than how to apply a meter stick to technological progress. What should the techno-optimistic and future minded person take away from Clarke’s 1964 interview? Perhaps a healthy dose of reality. No single individual, no matter how brilliant, is going to be able to perfectly predict the future. Perhaps the best we can hope for is to accurately understand the trends in our own fields of expertise. Yet we must remember Clarke’s assertion at the beginning of the program. Those who wish to predict the future are stuck between two hard choices. Easily accepted predictions will seem ridiculously conservative with decades of hindsight. Daring visions will be ridiculed in their own time, but may (or may not) be vindicated in the future. As we struggle to understand what accelerating technologies may produce in the years ahead of us we will have to find the middle ground between Clarke’s hard choices. Undoubtedly however, another 50 years will find our own predictions to be insightful, hilarious, and perplexing in turn.